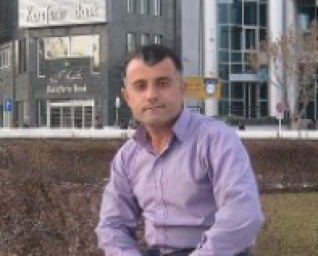 Kaleme: Labor activist Pedram Nasrollahi was arrested after he appeared in court on Wednesday, November 14, 2012. According to the website of the Coordinating Committee to Assist Establishment of Labor Organizations, Pedram Nasrollahi was a member of the Committee. He was transferred to Sanandaj Central Prison in Kurdistan Province to begin serving his 19-month prison sentence. In 2008, the Intelligence Ministry detained Pedram Nasrollahi in its Sanandaj Detention Center for 3.5 months. He was also arrested and detained in 2011. Charges leveled against Pedram Nasrollahi were "membership in the Coordinating Committee to Assist Establishment of Labor Organizations," and "dispatching news to an opposition website," for which the Sanandaj Revolutionary Court initially sentenced him to three years in prison. A Kurdistan Province appeals court later reduced his sentence to 19 months in prison. Support Pedram Nasrollahi NOW! Don't wait for "Regime change." Keep in mind that all these political prisoners inside Iran also oppose sanctions, and war, Coordinating Committee and all its members have a long established policy of opposition to Sanctions and War. continue to witness many laboractivists brutally persecuted and unjustly imprisoned in Iran. serious concern about the health and well being of Mr. Pedram Nasroolahi who has been unjustly incarcerrated only because of his independent views and social activitism. Pedram has committed no crimes. All he is asking for is the right to organise an independent Trade union for his fellow workers. After 34 years of barbarity by the Messianic Islamist Rapists, "reformers" and all, the only way out is regime change. backbreaking airtight sanctions plus air/navalquarantine is a must.